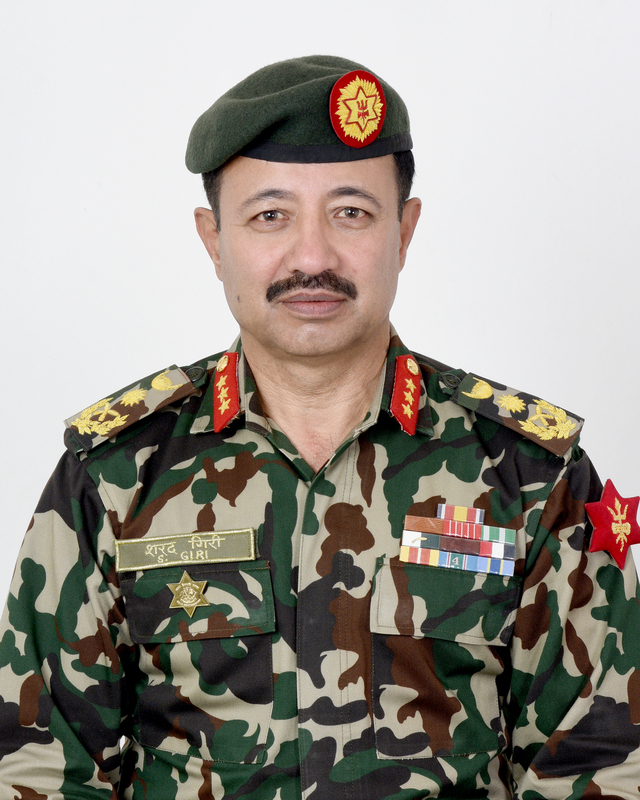 SUPRABAL JANA SEWA SHREE LT GEN SARAD GIRI, assumed duty as 21st Chief Of Staff of Nepali Army on December 28, 2018. A native of Gyaneshwor, Kathmandu, Lieutenant General Giri earned his commission from the Nepalese Military Academy, Kharipati in 1983 and joined Rajdal Battalion (Artillery). During his long and illustrious career, he has done Young Officers Course, Junior Staff Course and Company Commander Course from Army School Nagarkot, Regimental Signal Officers Course from Signal Training School and Field Artillery Officers Course and Regimental Survey Officers Course from School of Artillery, Deolali, India, Mid Career Course (Artillery) from School of Artillery Nowshera, Pakistan and Advance Artillery Course from School of Artillery, Fort Sill Oklahama USA. He has done Peacekeeping Latest Developments Course and Comprehensive Security Response to Terrorism Course from USA. He is a graduate of Army Command & Staff College Nepal (1997-1998), Defense Service Staff College, Wellington, India (1998/99) and Defence & Strategic Studies Course from National Defence University, Beijing, China (2012/13). During his 36 years of distinguished Army Career, Lt Gen Giri has held varied and prestigious assignments such as command, staff, instructional and United Nations mission appointments. He commanded No.7 Independent Light Battery (Artillery) (1995-1997), Rajdal Battalion (Artillery) (2001-2003),No 9 Infantry Brigade (2010-2011) and Valley Division (2016-2017). On instructional tenure he was Commandant of Artillery Training Center in 2001 and Directing Staff (2003-2004) Senior Instructor and Chief Instructor at the Army Command and Staff College (2006-2009). Lt Gen Giri was Commandant of Army Command and Staff College prior to assuming the duty as Chief Of Staff. In a distinguished military careers panning nearly four decades, he has had varied experience on numerous critical Command and Staff appointments. He has held staff appointments as Chief Operation Officer of 19 Infantry Brigade, Assistant Chief of Staff Operation of Mid Division, Assistant Director at Staff Duties and Policy Directorate, Director of Staff Duties, Plans and Policy Directorate, Director General of Staff Duties, Plans and Policy (DGSDPP) and also Director General of Military Operation (DGMO). Lt Gen Giri brings with him enormous experience of serving as a member of United Nations Interim Force in Lebanon (UNIFIL) on three occasions holding appointments as Platoon Commander in 1989, Operation Duty Officer at the Force HQ in 1993 and Personal Staff Officer of the Chief of Staff in 1999-2000. He also has had the distinction of serving with the United Nations Peacekeeping Force as Military Observer with United Nations Mission in Democratic People's Republic of Congo (MONUC) in 2003-04. He is an avid reader and holds a Master’s degree in Political Science from Tribhuvan University, Nepal and Masters of Science in Military Science (Science of Military Strategy) from National Defence University of PLA, Beijing, China. Lt gen Giri, is well read and decorated with Suprabal Jana Sewa Shree. He is married to Rita Bhatta Giri and blessed with a son Rhythm.